What was the fate of Dr Fate? After the naming of the DC 52 many (myself included) feared the treasure trove of concepts that make up the Justice Society could be forever erased, as the new universe reinstates Superman as the world's first super-hero. 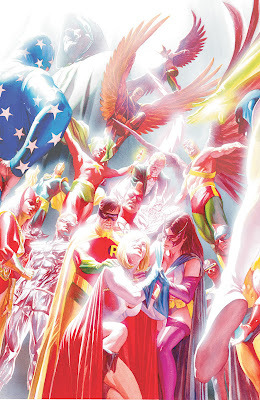 Never ones to just say "Aww shaddup 'n wait" DC today after a healthy amount of fret time announced the JSA were on the way back, bringing with them the return of the Earth-2 concept synonymous with DC's history. 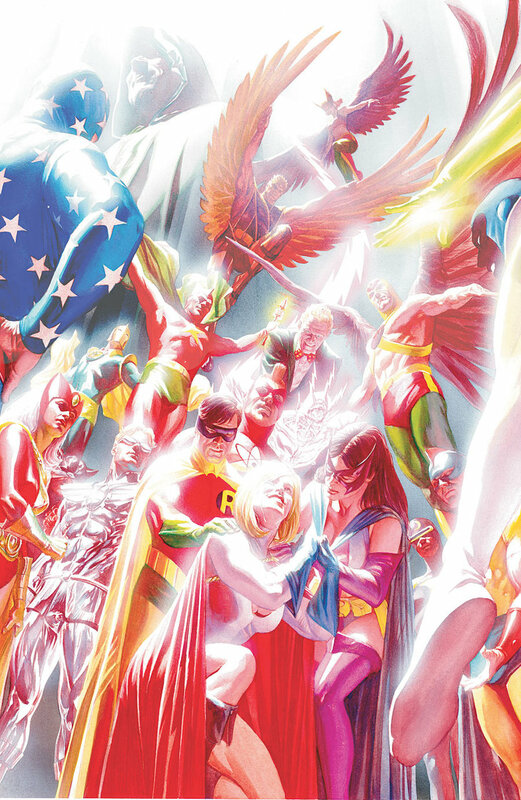 James Robinson, writer of JSA: The Golden Age where the team take on a super-powered Hitler, is already working on the book, setting the team in a specific time period (please, pwease, puh-leeze let that be WWII) and promising 'deceased characters' will be alive and well in the new DC 52 multiverse. Wonder Woman, Spectre, Sandman, Infinity Inc., Huntress, The Multiversity. What this news means as well as the characters it could effect, is as exciting and as awe-inspiring as the concept of Earth-2 was originally created to be. While the actual Society's line-up is still under wraps, Nicola (I can do Wonder Woman, I can do Secret Six) Scott is the artist for the milestone relaunch, making it already a book to start saving for. Can't you imagine some pimply intern standing around the DC offices six months ago saying, "Hey, if there's no Infinity Inc. made up of the Justice Society's children, how do we explain where Neil Gaiman's perpetually in-print SANDMAN comes from? I mean, Daniel's parents, images of Wesley Dodd,... the JSA even make a cameo in 'Season Of Mists'. I mean, are we gonna haveta cancel that big, upcoming annotated reissue program?" And then, of course, Dan Didio's mouthful of morning coffee turns his office wall into an instant Jackson Pollock. Ha! I think that is one of the best comments I've ever read pbl! Yeah that's going to be the challenge for DC - taking their big money making stories and ensuring they all fit in while still appearing to new readers as new. DC is ahead of all other publishers on it's trade program, and from Sandman to Hush, The Great Darkness Saga to Morisson's JLA they'll be wanting to keep the interest in those books going. At least you'd hope so! Love that Parobeck JSA. I'd like to have Beth Chapel/Dr Midnight back but I suspect I'm in a very small minority. 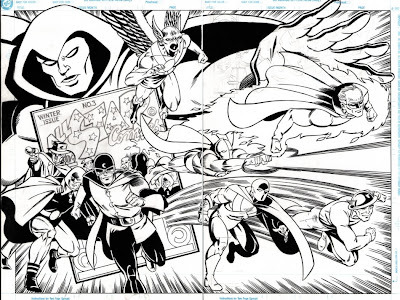 Dougie - I completely agree - That Parobeck splash of the JSA is one of the all time bests of the team. Finally I had a good enough reason to pull it out! 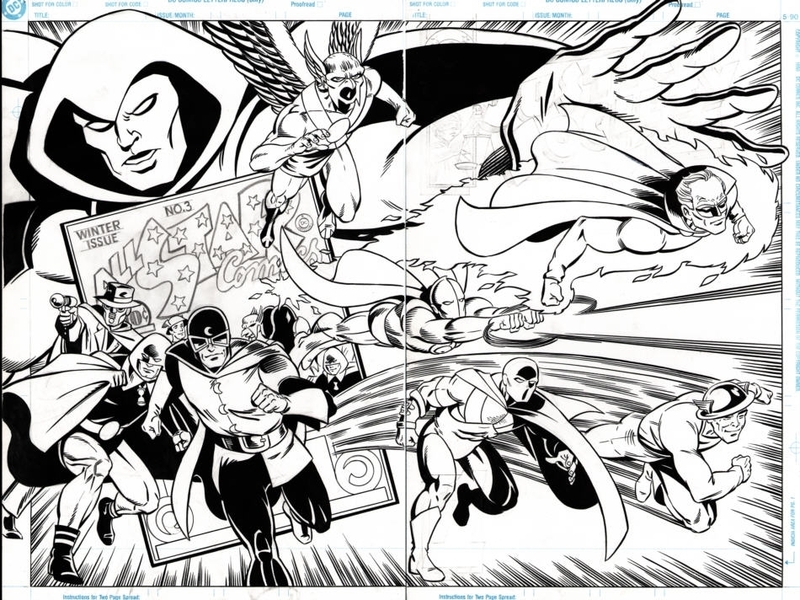 Mike Parobeck's art is the reason I picked up the only Impact comicI ever read. In fact I'm going to post it's cover as a tribute to the his work in the sidebar of the main blog. Having died at such a young age, he would easily be one of the 'giants' if he were still with us today. And this is the sort of thing that makes me think of nerdy crossovers like Superman vs Red Skull or Captain America vs Captain Nazi. Yeah it is one of those crazy comic only kind of situations ain't it Pensol! The Golden Age is a great mini - and who saves the day might just surprise you! Actually I should do a bit of a write up on here come to think of it. If you read it first, let me know what you think. Captain America vs Nazi's or Wonder Woman always goes down well. I think a baroness back in WW's rouges would be a brilliant move in the new DC 52. Comics need more great female rouges! !